Sofia Bulgaria was the setting for the first ever A to JazZ Festival celebrating American jazz which took place in the scenic Doctor’s Garden, an outdoor park in the heart of this historic Eastern European capital. For three days, enthusiastic audiences were entertained with music performances featuring a collection of talent from Bulgaria and the U.S. Concluding the three day event was a Frank Sinatra tribute performed by Monty Aidem of Los Angeles, a Frank Sinatra tribute artist, or “Frank Sinatra Impersonator“, and a multi-credited TV writer who actually wrote for Frank Sinatra on several occasions. 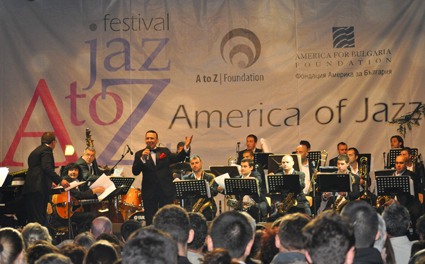 He was supported by Bulgaria’s outstanding big band, The Brass Association, under the direction of Angel Zaberski. Zaberski is a highly regarded composer, conductor, jazz pianist and recording artist; one of Bulgaria’s finest. Lending support and encouragement to the three day cultural exchange was the U.S. 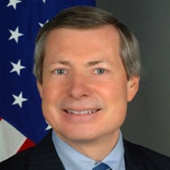 Ambassador to Bulgaria, James B. Warlick, a supporter of the arts as well as a positive influence toward the good relations between the United States and Bulgaria, where he is very popular. 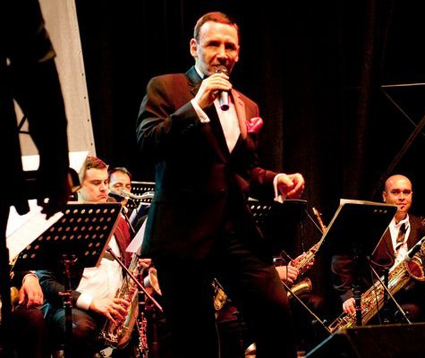 Performing the Frank Sinatra tribute show, Monty Aidem offered 14 of Sinatra’s most popular titles, including Come Fly With Me, I’ve Got The World On A String, and Fly Me To The Moon, among others. Some of the best acknowledgement came for the internationally acclaimed songs Strangers In The Night, My Way, and New York, New York. Aidem even sang My Way on Bulgaria’s leading TV talk show, Slavi’s Show, hosted by Bulgaria’s popular TV personality Slavi Trifonov. Since English is spoken by many Bulgarian residents, Aidem was even able to tell some jokes in English that were widely understood by the audience, eliciting laughs just as those jokes do in America. Aidem was impressed with the Bulgarian orchestra, who played the charts flawlessly and with great style, following the lead of conductor Angel Zaberski, whose feel for the music is so instinctive it would most likely have impressed Sinatra himself. But credit for the festival’s success must go to its creator and chief executive Peter Dimitrov, a man with a vision, plus the plans and determination to make his vision a reality, which he did with great results, as both participants and visitors to the festival would no doubt agree. At the studios of Darik Radio Bulgaria with (L.to R.) radio host Niki Kanchev, the Jazz festival's Diana Todorova, Monty Aidem, and festival creator Peter Dimitrov, who's also a musician and radio host.